Factory-built homes once had a bad reputation as cheap boxes. Now there are different builders serving different parts of the market and it’s possible to buy high-quality, customized manufactured homes. As a result, a small but growing number buyers are now considering factory-built homes as a way to overcome delays in conventional construction. There are two different kinds of factory-built homes. Panelized homes have different components like walls, roof and floor manufactured separately in a factory. These are then transported to the building site for assembly. 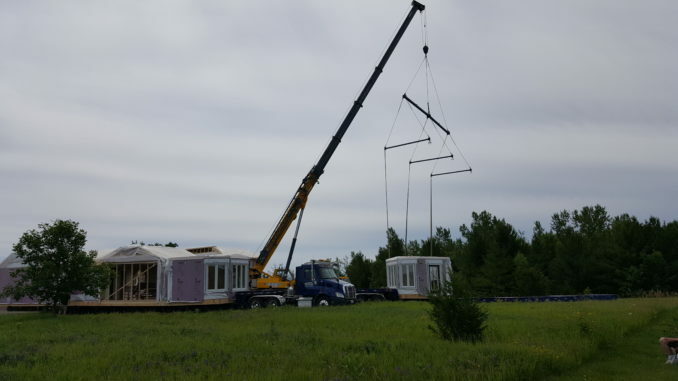 Modular homes are built almost completely in a factory in several box-like modules, each including floors, walls, ceilings, wiring and plumbing. These modules are delivered by truck and assembled onsite. Modular homes are usually more affordable than panelized building. Manufacturers of factory-built, modular homes claim a 10-20% cost advantage when compared to costs for a new house built completely on site. Many of the issues are the same as for a conventional home including permitting, site preparation, installing well & septic, and building the foundation . Factory-built homes may not be for everyone, but it’s still an option you may want to explore if you’re in the market for a new home. Examples of well-known Ontario builders include Guildcrest and Royal Homes.